The CAGE is the pinnacle of concussion reduction technology. Its primary essential task was to disrupt side concussion while keeping or enhancing the characteristics of the Gamma and Epsilon series of muzzle devices. It accomplishes this with ease. The sides of the CAGE utilize a series/pattern of small holes which move over the chambers of the Gamma and Epsilon devices. This allows the gasses to expend energy more uniformly and slows them down while moving through the porting thus disrupting horizontal concussion AND allowing the muzzle brake to have more time to influence the gaseous escape through all the ports. This leads to an extremely smooth recoil and zero muzzle flip by “bleeding off energy” rather than abruptly losing energy. 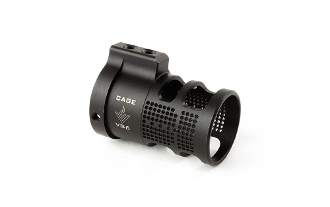 The CAGE device offers absolute control while sparing the concussion of a bare muzzle brake. COMPATIBLE MUZZLE DEVICE Works with Dual Chambered Muzzle Devices, GAMMA 556, GAMMA 556 EX, EPSILON 556, GAMMA 300BLK and EPSILON AK. * Muzzle brake is not included in this package.